I love Mangan. It's got a great ambience for really affordable Filipino fare. 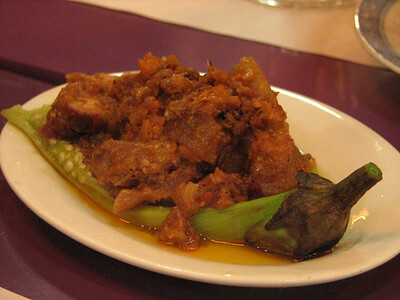 recently though, I am a fan of their pork binagoongan. It's really just three pieces of pork served on top of an eggplant but it is just perfectly made all the time. The shrimp paste used is not that salty, the tomatoes are bordering on crunchy, the pork is tender. I don't eat eggplant but my husband loves how it's perfectly cooked all the time. So the next time you're eating there, don't miss the Pork Binagoongan. Have it with lots of rice and sago't gulaman, and I tell you, you'll be a satisfied customer! tried it once and yes, it's the best!